Until you lose a tooth, you may not realize how much you value a healthy smile. Luckily, dental implants provide an excellent long-term tooth replacement option. Dr. Steve Pleickhardt, your Gainesville, VA dentist at American Dental, explains how you can benefit from a dental implant. Bridges and dentures close the gap in your mouth, but unlike dental implants, they don't reach below your gums. 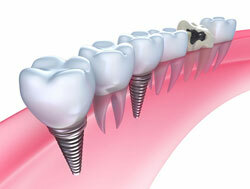 Dental implants, which look like tiny screws, are placed in a hole in your jawbone during a minor surgical procedure. Over the course of approximately three to six months, your implant begins to bond with your jawbone in a process called osseointegration. 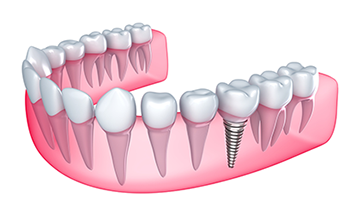 Once the process is complete, your implant is just as strong as the roots it replaced. No Change to Your Jawbone: The roots of your teeth constantly stimulate your jawbone and keep it strong. Once the roots are gone, the area under the tooth begins to shrink and weaken. Eventually, jawbone weakening can lead to further tooth loss and facial sagging. Since implants replace your roots, your jawbone stays strong. A Stable Foundation for Your Crown: After osseointegration occurs, your Gainesville dentist attaches a crown to your implant. The crown takes the place of your tooth above the gum line and looks very natural. Poorly fitting bridges or dentures can cause gum irritation if they slip when you bite and chew. Because your implant bonds to your jawbone, it provides a very stable foundation for your crown, and you never have to worry about irritation due to slippage. A Better Option for Your Budget: The initial cost of a dental implant can be higher than a bridge or dentures, but it's important to consider the lifetime costs of each option. With proper care, your implant will never need to be replaced, but you'll probably need to replace your bridge or dentures several times during your lifetime. Are you ready to improve your smile with dental implants? Call Dr. Pleickhardt, your Gainesville, VA, dentist at American Dental, at (703) 753-6695 to schedule an appointment. Restore your smile with dental implants!